A couple of weeks ago Vancouver was hit by a significant (at least by our standards) and unexpected snowfall. For a city more used to being wet than white, the truth is that Vancouver has it pretty easy when it comes to winter weather – the generally mild climate means that we always plan for rain, but not as much for snow. True “winter cities” like Ottawa and Montréal where I grew up, or central Canadian cities like Winnipeg, Regina, Edmonton and Calgary, know what it means to plan and design for cold and snow. It’s a full-time mind-set. Every-day details factor in the cold, things warm cities don’t have to worry about – designing play areas in ways that consider winter micro-climates; inventing creative infrastructure like heated bus-stops powered by waste heat from the sewers; and we can never forget the literally life-and-death implications of having too-few extreme weather shelter spaces for the homeless. Some actually think our usually mild weather in Vancouver makes it “easy” to live on the streets here, but distributed, accessible emergency cold weather shelter beds are desperately needed each year – unfortunately with a pattern of annual controversy in neighbourhoods that we really must get past through longer-term solutions. How to get around is always one of the biggest challenges for winter cities, especially when the big storms hit. It can be a good reminder that walking cities are resilient cities, in winter, and the rest of the year as well. Unfortunately, many winter city design solutions can actually be un-helpful for a city’s walkability. This can be seen in the design of streets, where the challenges of snow-storage can make streets excessively wide, expensive and less friendly to walkers year-round. Similarly, excessive mall surface parking lots can be justified because of snow storage needs on the snowiest shopping days of the year – leading to partially empty parking lots much of the time. 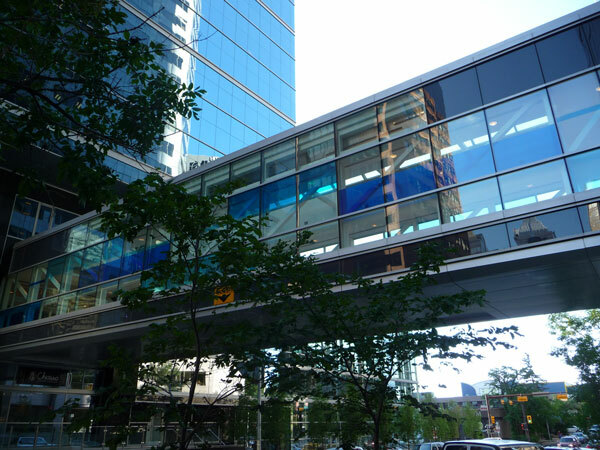 Calgary’s +15 elevated walkway system. Photo courtesy of Brent Toderian. Cold weather was the inspiration for whole new pedestrian systems such as Calgary’s elevated +15 walkway system, or Toronto’s underground PATH system and Montréal’s Place Bonaventure subterranean network. Such systems can seem hard to resist when cold weather hits, and in a way can assist walkability by providing a warm, if often indirect and confusing, pedestrian opportunity in winter. Many cities though, now understand they also have harmful effects on the street-life below and above them, year-round. After virtually turning their back on their streets because of the cold, thankfully many such cities are putting their attention and energy back to lively walking environments at street level. Much of the media’s winter attention tends to focus on “snowmageddon” driving conditions and snow clearance budgets. This year there was a small media and politician-fueled controversy around how fast Vancouver’s separated bike-lanes were cleared of snow. Perhaps this is understandable in the early years of our separated bike-lanes, but mature winter biking cities like Copenhagen and Amsterdam know that if you want year-round urban biking to be an inviting option, bike-lane snow clearance has to be a priority. And urban biking, like transit, is just an extension of walking, with every trip starting and ending with your feet. In the broader sense, big snowfalls can illustrate how especially vulnerable car-dependent cities and suburbs are to disruptive weather patterns. Is everything you need widely separated – home, job, shopping, your kids’ activities, with driving the only option? If so, snowstorms can really make life difficult or even miserable. Compact, “complete,” walkable, transit-friendly cities on the other hand might feel the effects of snowstorms, with disruptions to transit especially where it shares the roads with cars, but they tend to be more resilient, with things a closer together and more options on how to get around. On the day of Vancouver’s big snowfall last week for example, my chores by foot and transit were delightful, if a bit damp. For those in their vehicles though, the experience was very different, whether they had snow-tires or not. Our recent snowfall illustrated is that even Vancouver, not really a winter city in the common use of that title, needs to think more about our ability to handle tougher winter conditions. With the weather being less predictable, and frequency and intensity of storm events getting worse with the consequences of climate change, anticipating and designing for unusual weather conditions is going to be the new normal for all of us. But enough about the challenges of winter cities. Although it’s looking gloomy out there today and the chances of a white Christmas are slim, there’s a brightness that comes from the Holidays that we can always look forward to. 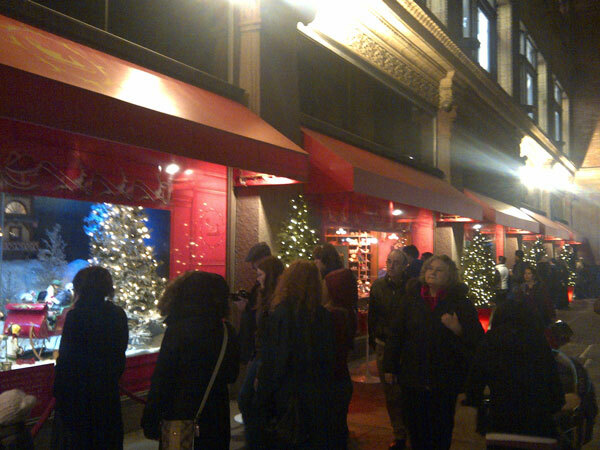 The Bay’s holiday animated window displays in downtown Toronto. Photo courtesy of Brent Toderian. The holiday season can be wonderful for a walking city. With lights, banners, animated window displays, winter-themed art, and festivals put on by business associations, streets can come alive and animate the city. It’s like an extra “layer of life” on top of our regular downtown and shopping streets – a layer that can make an average street excellent, and an excellent street fantastic! One of my best childhood memories of Christmas growing up has always been Christmas shopping on Ste. Catherine St. in Montréal – the snow always made one of my favorite streets so much better. Add to that the enlivening of the city’s public spaces and parks. 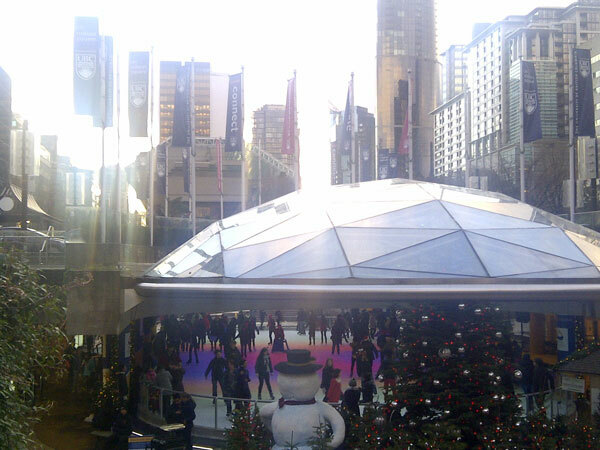 The most iconic example might be skating at New York’s Rockefeller Center, but here in Vancouver we have skating at Robson Square, turning a usually dead submerged space into a winter magnet for people. There’s the beautiful Christmas lights at Vandusen Gardens and Stanley Park, drawing families out into the cold with hot chocolate and good cheer. Even the usually quiet plaza at Queen Elizabeth Theatre is taken over for the holidays by the Vancouver Christmas Market, drawing lively crowds. The Holidays can inspire people and families to get out walking and enjoying public life in the city – and the city looks more beautiful and jolly regardless of weather or shopping crowds. It can be a bit sad when that holiday layer goes away, and the streets and public places return to normal. Wouldn’t it be great if our city’s streets were that full of life every day? So this season, whether you live in a winter or warm city, perhaps we can take a break from snow clearance arguments and debates about budget priorities, and take the time to walk around, really look around, and appreciate the wonder and life that the Holiday Season brings to our cities…and perhaps try to extend it.